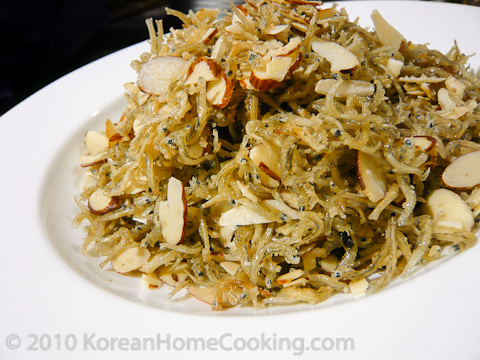 I love Korean-Western fusion dishes because they tend to bring out the best of both cuisines. This butter-roasted anchovies is a good example. I find the combination of salty anchovies roasted in sweet butter and mixed with almonds to be surprisingly delicious. They are crunch and salty, and can be quite addictive. I keep eating them as snacks even after finishing my meal. 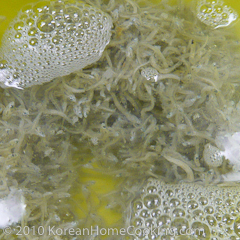 The anchovies I used here are really tiny ones. 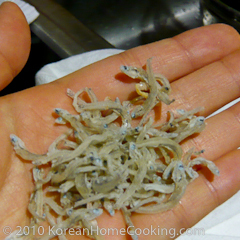 Each anchovy is probably less than a quarter of an inch tall and thinner than a thread of yarn. .
Soak the anchovies in water to wash and then squeeze dry them. 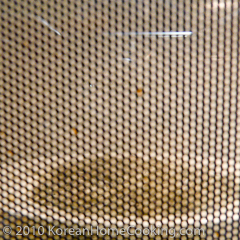 Spread them on a large plate and microwave for 3 minutes to dry. 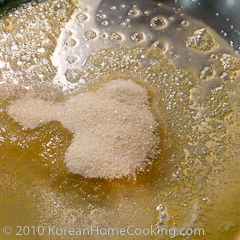 Melt the butter and sugar in a skillet over low to medium heat. 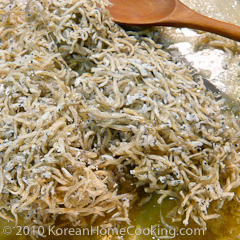 Mix in the dry anchovies to butter mix and stir-fry for approximately 5 minutes. The key is to stir-fry patiently for long time over medium heat. 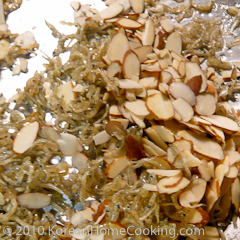 Add sliced almonds to the anchovy mix from Step 6 and stir-fry another minute or so. That actually sounds very good! Very creative. Hi Renee, Thanks for stopping by!